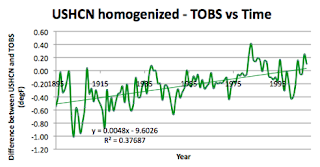 At present I am studying the temperatures, as reported by GISS, the homogenized USHCN temperatures and the Time of Observation corrected, otherwise raw, data for a strip of states in the Midwest. 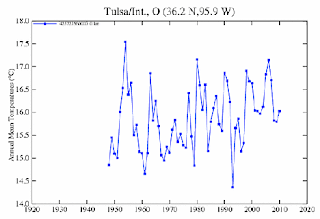 I have reviewed the temperatures for the more Western states (list on the right side) and have now reached Oklahoma, after revisiting Kansas last time. As I go through the states it is possible to draw some conclusions from the data, and so, over time, these posts have changed in structure as I find things that are interesting to note. 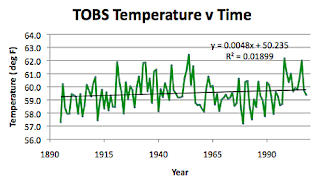 This post is no different, in that I have realized that using average temperatures over 115 years to plot against current population might not be really useful. 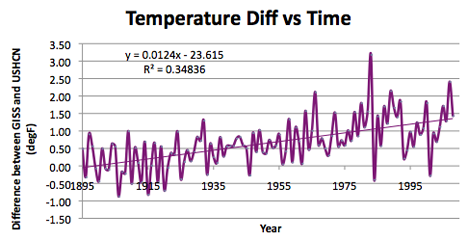 Thus, at the end of the post I lhave compared that plot with one that just uses the last 30-years of station temperatures. 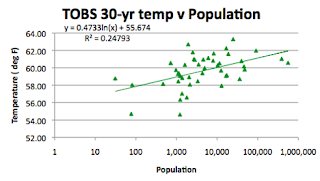 Since I get an r-squared correlation of 0.25 for the log-normal relation I will be using the 30-year information for the temperature:population plot in the future, and will be adding that graph to the previous state reports as I get time. 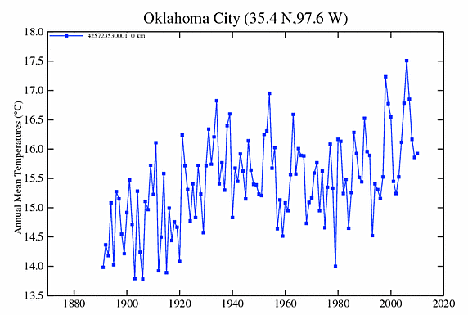 Oklahoma has 44 stations in the USHCN network from Ada to Webbers Falls, and they are spread relatively evenly over the state. There are two GISS stations in the state (according to Chiefio’s list) and these are in Tulsa and Oklahoma City. Well guess what? 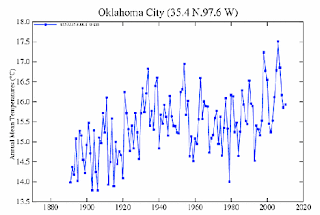 There is a full record for Oklahoma City, but as for Tulsa . . . .(see below the fold). 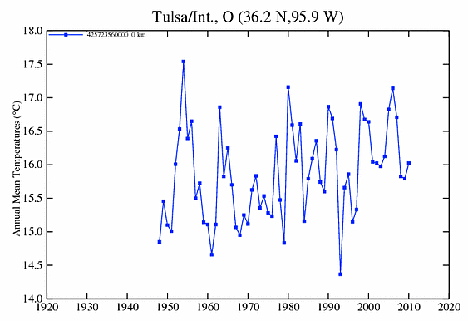 It is perhaps now no surprise, sadly, that the record for Tulsa only goes back to 1948. Filling out the population data, Kenton does not appear in the citi-data set, and so I used zip-codes.com to get 77. 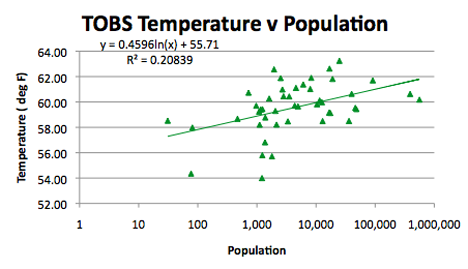 Otherwise the population data was all obtained using citi-data information. 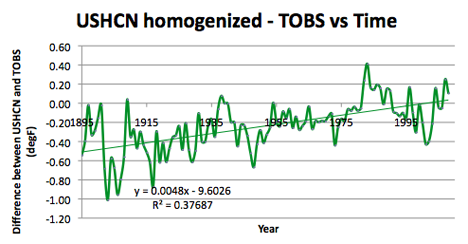 Difference between the average GISS station data, and that of the homogenized USHCN station numbers. 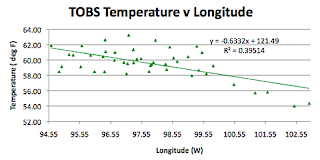 The temperature rise for the state has averaged some 0.48 degrees F per century, whereas if the homogenized USHCN data is used, then the rise has been 0.94 degrees F per century. 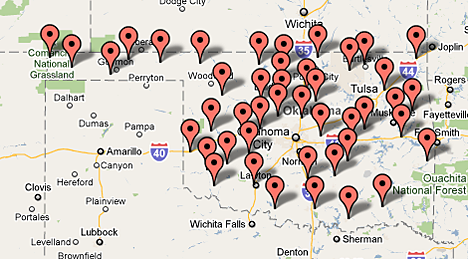 Looking at the geography of the state, Oklahoma is 478 miles long (E-W) and 231 miles wide. 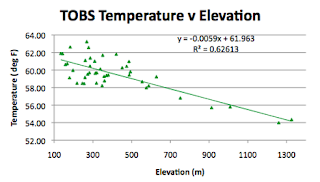 It runs roughly from 94.5 deg W to 103 deg W, and from 33.5 to 37 degrees N. It rises from 88 m to 1,515 m above sea level, with an average elevation of 396.2 m. (The average USHCN station elevation is 415 m, and that of the GISS stations is 300.2 m). 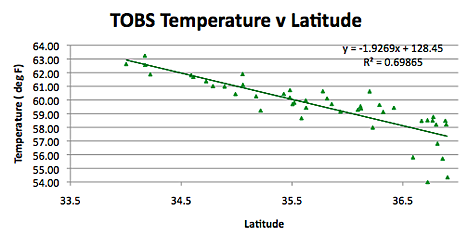 There is a strong correlation with latitude over the state. The correlation with longitude is confounded by the rise in elevation as one moves west. 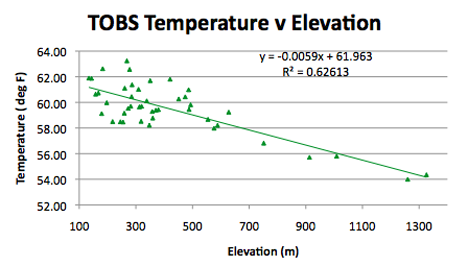 Thus the correlation with elevation is more important. Turning to the effect of population, the data that I have is for most recent population and until now I have been plotting overall average temperature against this value, but more properly I should only be using more recent temperatures. Out of curiosity, therefore here is the plot using the overall average temperature relative to the station current population, and then the average of the last 30 years, temperatures used instead. 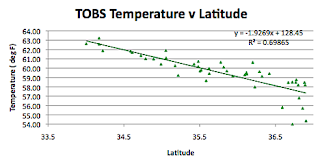 First here is plot using the overall average temp for each station. And then here is the plot using only the last 30-years of data for each station. Given that the population number used more accurately reflects the temperature over the period, it is perhaps no surprise that the correlation is better, and so I will use that time interval in the future posts on this theme. (And in time will go back and adjust the plots in the earlier posts – UPDATING the lead in to show that I have done so, as I do). Is Nero playing the fiddle?